SAN BERNARDINO, Calif. -- Here is what we know about the mass shooting at an Inland Regional Center building in San Bernardino on Wednesday. San Bernardino police identified Syed Rizwan Farook, 28, and Tashfeen Malik, 27, as the suspects in the mass shooting. It was confirmed Farook was an American citizen. The suspects were married, according to Farook's brother-in-law. Suspects fired between 65 to 75 rounds during shooting at Inland Regional Center. Officers said they are "reasonably confident" there were only two suspects involved in the mass shooting. Authorities continue to search a home in Redlands that was confirmed to be connected to one of the gunmen in the deadly mass shooting. 12 pipe-bomb-type devices were found at the Redlands home. Farook and Malik were the suspects in the massive shootout, located 1 mile south of the IRC building, involving police and a dark SUV. San Bernardino police were chasing the dark SUV before the incident ended in gunfire. Law enforcement fired 380 rounds at the two suspects at end of that chase; suspects fired 76 rifle rounds, but had additional 1400 rounds on them. One officer was struck in the shootout but did not suffer life-threatening injuries. Inland Regional Center is comprised of three buildings. The shooting occurred in the building with the main auditorium during a holiday luncheon for the San Bernardino County Health Department. Approximately 550 people typically work at the Inland Regional Center on an average day, a regional center employee told Eyewitness News. ATF, FBI agents assisting local agencies. 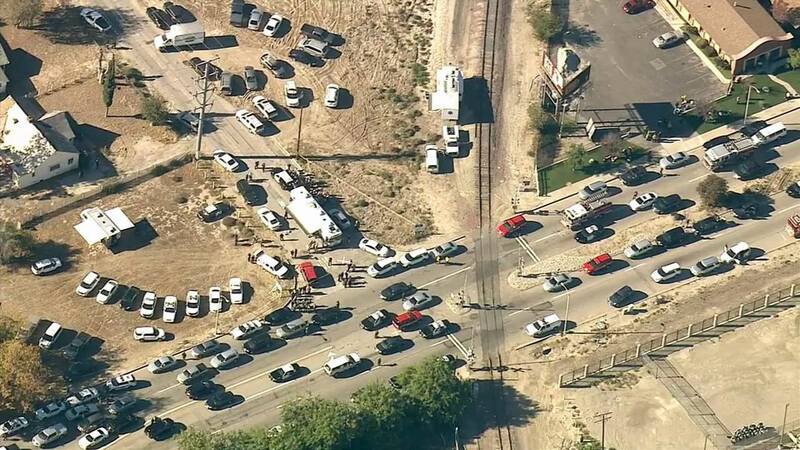 Click here for full coverage on the active-shooting situation in San Bernardino.